A successful ballot at the previous meeting saw the Lodge of Peace and Unity No 314 install Ian Crawford Walton as the next master of the lodge. David (left) congratulates Ian on attaining the chair. The principal guest of the evening was Assistant Provincial Grand Master David Randerson. He was supported by Past Provincial Grand Master Peter Hosker, Past Deputy Provincial Grand Masters Tom Blackburn and Howard Jones, Past Assistant Provincial Grand Masters Bill Huck, Philip Gardner and Harry Cox, a positive galaxy of grand officers, the Preston Group Chairman and immediate past master of the lodge Steve Bolton and acting Provincial grand officers. With well over 50 other brethren in attendance, the event was certainly well supported. Prior to opening the lodge, David Winder, as master, welcomed all the brethren in attendance to what promised to be an excellent and memorable occasion. The lodge was duly opened and the administrative business conducted. 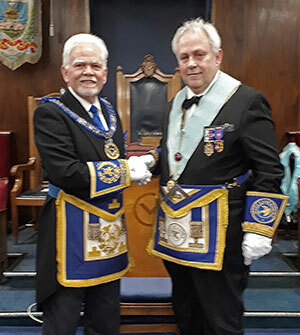 On this occasion it included the admission of John David Lee and John Newton Stanley as joining members.The lodge was then raised to the third degree whereupon the lodge director of ceremonies John Kay, requested permission to retire for a short time. He duly re-entered to announce the presence of the principal guest of the evening, Assistant Provincial Grand Master David Randerson. David entered in due form, accompanied by other Assistant Provincial Grand Masters, grand, Provincial grand and acting Provincial grand officers to be formally welcomed by David Winder. In turn David responded by thanking David Winder for his generous welcome. Following extended salutations, the lodge returned to the second degree and Ian Walton was duly presented for installation by Howard Jones. Ian recited his obligation as master elect before the lodge resumed working in the third degree. Taking his last action as master, David Winder thanked all his officers for their support and assistance during his year in office. He then proceeded to install Ian as the 222nd master of the lodge in a flawless text book manner. The working tools of the third degree were presented by David Edwards, the second degree working tools by Robert Pye, and those of the first degree by Brian Holden, all of whom gave first class presentations that were greatly appreciated by all present. Following his installation in the chair, Ian was addressed by Howard Jones who repeated the high standard set by the working tools team. Continuing with the investiture of the lodge officers, Ian invested the senior and junior wardens, David Tattersall and Brian Holden and instructed them in their respective duties. The address to both wardens was commendably presented by Bill Huck. Robert Irwin was re-invested as the appointed almoner and the lodge charity steward. The position of lodge mentor was undertaken by John Kay. The investiture of officers continued, with all being instructed in their duties by Ian as he presented them with their collar of office. The ceremony of installation concluded with the address to the brethren of the lodge delivered in an excellent manner by Tom Blackburn. As is tradition in the lodge, and with the insistence of the outgoing master, Howard, Bill and Tom were each rewarded for their valued contribution with appointments as stewards of the lodge. David Randerson, as principal guest, had the pleasure of bringing the congratulations of the Provincial Grand Master Tony Harrison. On his behalf, he congratulated the lodge on what he felt had been an excellent and very enjoyable meeting. He congratulated all those that had a part to play in the proceedings. He particularly mentioned the splendid work of David Winder, as the installing master and concluded by congratulating Ian on attaining the chair of such a prestigious lodge, wishing him well for what he was sure would be a marvellous year in office. Ian, in turn, thanked David Randerson for his kind and generous comments on behalf of the Provincial Grand Master and had the pleasure of presenting him with two charity cheques; the first, to the value £2,000, was in favour of the MCF 2021 Festival and the second, for £1,000 was in favour of the West Lancashire Freemasons’ Charity. These contributions were in addition to the £1,000 donated to the Preston Masonic Hall earlier in the season. Concluding the proceedings, the retiring master was presented with a past master’s jewel by Ian Walton. On behalf of the lodge, Ian thanked David for his valued contribution during his year in office, particularly whilst having the dual role of also operating as an Assistant Provincial Grand Master. Later in the evening, in his response to the toast to the grand officers, David Randerson, as the principal guest and on his own behalf, congratulated the lodge on what he felt had been an excellent and very enjoyable meeting. He complimented the working tools team on what had been delightful presentations and particularly mentioned the excellent work of the ‘elder statesmen’ team who presented the addresses to the master, wardens and brethren in such an eloquent manner. He went on to congratulate Ian on attaining the chair of a lodge that had made such a remarkable contribution to Preston Freemasonry over 200 years of its existence. He thanked Ian for the very generous charity donations he made earlier on behalf of the lodge and wished him well for his coming year as master. David continued by emphasizing the importance of supporting MCF 2021 Festival; he explained that West Lancashire Freemasons’ Charity accepted the priority given to support for the Festival and was aware that ongoing support for West Lancashire Freemasons’ Charity would resume at the conclusion of the Festival. Moving on, David expanded on the importance of the “Ambassador’s role”, adopted as an initiative by the Province. He concluded his response by congratulating the lodge on the way it continues to build for the future with new members who are anxious to take part in the ritual as well as attending meetings. Closing his response, he congratulating lodge member David Edwards, on his forthcoming appointment as the senior warden of the Province. Ian surrounded by his supporters. The evening’s proceedings were further enhanced by a delightful duet rendition of the master’s song given by Ian Cuerden and John Kay, accompanied by David Tattersall on the piano. As part of the celebrations, John Clulow, representing the 2019 Preston Masters, had the privilege of welcoming the Preston Group’s newest master into the happy band of current masters. The evening was rounded off with Ian, presenting David Randerson with a bottle of whisky from the lodge, as a token of appreciation for his attendance as the principal guest of the evening. Article and photographs by Malcolm Berry.